Birmingham born and bred, I came to Calne, Wiltshire to teach, and settled in the area. When you have Cherhill White Horse, Silbury Hill and Avebury Stone Circle on your doorstep, why live anywhere else. I have been writing since I was little: thank-you letters to Aunties for knitted gloves at Christmas; keeping a Letts Schoolgirl Diary which recorded meals I ate, sweets I bought, games I played and TV programmes I watched. I wrote poems and stories and entered competitions in the Children’s Newspaper and won school essay prizes. 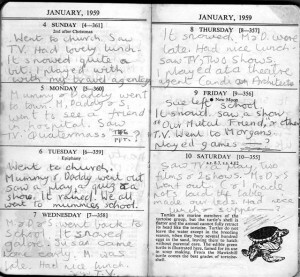 My diaries expanded, as I got older, to A5 Page -a-day ones – entries full of teenage angst and unrequited love. I started a novel and tried my hand at TV drama, influenced by what I read and saw. I loved writing but I wanted to be an actress. I was an avid reader of Plays and Players magazine. I went regularly to the Birmingham Rep, where Derek Jacobi, Ralph Nossek and Bernard Hepton were resident actors. I went on school trips to the RSC at Stratford where I saw such greats as Vanessa Redgrave, Ian Holm, David Warner and Eric Porter. I was a regular visitor to the Devonshire Park Theatre in Eastbourne where we used to go on holiday. Lots of comedies and murder mysteries and waiting at the stage door afterwards for signatures. I watched adaptations of the classics on TV and regular favourites such as The Lone Ranger, Quatermass and Z Cars, moving on to the gritty The Wednesday Play series, with directors and playwrights such as Dennis Potter, John Hopkins and Ken Loach. And of course there was Crossroads which ran from 1964 -85. How could a Brummie not watch that! Everyone knew someone connected to the soap. I had my first rejection letter at sixteen from the BBC for a TV play I wrote about a love affair with a jazz trumpeter. There wasn’t much plot from what I remember but loads of atmosphere and music and an unhappy ending. I think I was ahead of my time. Later in my writing career, I had a couple of monologues performed on stage and a radio play on RTE, and many rejections from the BBC for my radio sitcoms. Still open to offers. 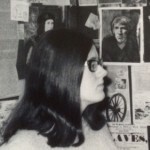 I write mainly short stories and articles for magazines. I moved into local history when I was commissioned to write some books using images from the Francis Frith Archives. I saw an advert in Amateur Photographer asking for anyone with local knowledge to write captions for some of their Wiltshire images – and it turned into a bigger job. My Wiltshire books published by Francis Frith include: West Wiltshire Towns; Calne Living Memories; Devizes, Town & City Memories series; Trowbridge, a History & Celebration; and Walk Around Historic Trowbridge). The Little Book of Wiltshire was published by The History Press in 2013. A memorable moment. 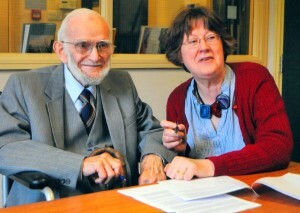 Dee and Charles Waite sign their book contract with The History Press for ‘Survivor of the Long March, Five Years as a POW, 1940-45′ published January 2012. A new paperback edition was published February 2017. Charles’s story lives on. My first non-Wiltshire book was Survivor of the Long March. Five Years as a POW 1940-1945 co-written with Charles Waite (The History Press) 2012. A new paperback was published February 2017 (with additional material). The Road to Civitella 1944: the Captain, the Chaplain and the Massacre (Fonthill Media) was published October 2016. 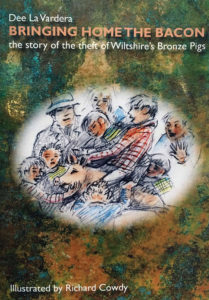 In 2018 I published Bringing Home the Bacon, the story of theft of Wiltshire’s bronze pigs with illustrations by Richard Cowdy, sculptor of the Two Pigs. I wrote regular features for Guardian Education, Wiltshire Life, and Wiltshire Magazine. My work has appeared in: Bath Magazine, Organic Life, Ireland’s Own, Farmers’ Weekly, My Weekly, The Lady, the Southern Daily Echo, Writers’ Forum, Sunday Times, Take a Break, The People’s Friend and The Oldie. I have been a regular contibutor to BBC Wiltshire radio with my WOW (Wonders of Wiltshire) series, based on The Little Book of Wiltshire. 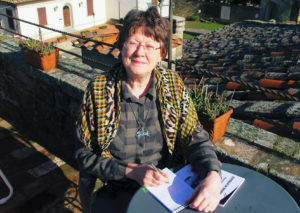 I am a member of The Society of Authors and the Society of Women Writers & Journalists (SWWJ). 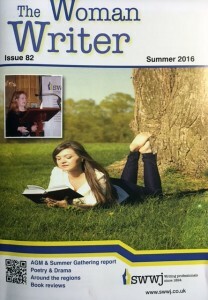 I keep members up-to-date with news down Wiltshire Way in my regular column, News from Moonraker Country in the society’s magazine The Woman Writer. Celebrating 120 years of the Society of Women Writers & Journalists in 2014 – in the words of our late President, the wonderful and sorely missed, Victoria Wood, CBE, “from pen and ink to Twitter, it’s one hundred and twenty years of creativity and communication”. I am a member of the JB Priestley Society and help to promote his work.